The new road starting from National Highway-1 to village Jamalpur Leli would benefit the residents of more than dozen villages and once it is constructed, the residents will no longer have to use the kucha roads for reaching their destination. This foundation stone of this 4-kilometer long road was laid by Sahnewal MLA and Irrigation Minister Mr Sharanjit Singh Dhillon. While addressing the gathering, Irrigation Minister Mr Sharanjit Singh Dhillon said that this new 4-kilometer long road is being constructed with a cost of Rs 1.03 crore and the constriction work has already been started. He assured that this road would be ready by April 2016 and it would benefit the area residents to a large extent. Dhillon said that this road would connect NH1 with village Jamalpur Leli and would further connect roads leading to villages Kasabad, Kutbewal and others. He said that with the construction of this road, four villages would be directly and 10 villages would be indirectly benefitted. 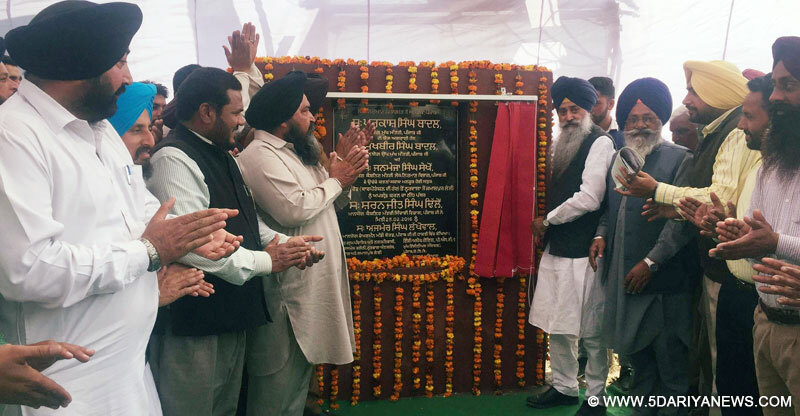 He said that this road would not only be strengthened but would also be widened.After laying the foundation stone, the Minister also held a sangat Darshan programme in the village Gurudwara. Mr Sharanjit Singh Dhillon assured the residents that the Punjab government is committed for the overall development of the state.Prominent among those present on the occasion included Jathedar Gurcharan Singh Meharban, Sarpanch of Village Kakowal Mr Maninder Singh Natt, besides several others.